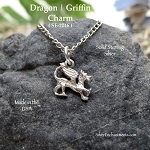 Gryphon Charms and Griffin Pendants - The griffin, griffon, or gryphon myth originates somewhere in the Near or Middle East. This mystical creature has the body of a lion and the head and wings of an eagle. It isfound depicted in ancient Babylonian, Assyrian, and Persian paintings and sculptures. It is believed the myths found life around 3,000 B.C. to be the Pharoah's companion in Ancient Egypt, and later became sacred guardians in Minoa. In Christian symbolism, the Gryphon originally represented Satan and evil, but later came to represent Christ, especially his dual nature, both divine and earthly, as the Gryphon had mastery of both land and sky, and was noble and majestic. Gryphons were said to kill serpents and basilisks, both embodiments of evil, thus protecting mankind. Gryphons symbolize both strength and wisdom combined in heraldry. On medieval buildings, Gryphons were often used as gargoyles, great stone guardians.